German electronics specialist Schukat electronic decided to pursue automation, opting for the new OSR Shuttle™ Evo. Learn more about the advantages of automating with shuttle technology. It's more than just storage. It's process innovation. Ready for the new work experience? Find out about our new goods-to-person work station for logistics and production in this video. We see it as our mission to provide the right solutions and technologies for these demands to guarantee your success. This is why we have never stopped enhancing our tried and tested shuttle technology. It is with great pride that we now introduce our new generation of automatic storage systems: OSR Shuttle™ Evo. With the OSR Shuttle™ Evo, we aimed at setting new benchmarks for efficiently organizing logistics processes. Watch this video to see how the OSR Shuttle™ Evo works and the advantages it offers. What is the OSR Shuttle™ Evo? The OSR Shuttle™ Evo is an automatic small parts warehouse designed for use as both a storage and picking system. Consequently, the OSR Shuttle™ Evo is at the heart of numerous logistics applications, facilitating efficient and space-effective storage, picking, buffering and sequencing of goods, orders and raw materials as well as supplying work and assembly stations. The OSR Shuttle™ Evo is also fully integrated into the entire logistics solution. Learn more about how a shuttle system like the OSR Shuttle™ Evo works. What advantages does the OSR Shuttle™ Evo offer? Higher, faster, better, more flexible and economical – the OSR Shuttle™ Evo combines the best of all earlier shuttles in an innovative system approach. Scale and customize the automated storage system OSR Shuttle™ Evo to your needs. Add shuttles and lifts for more performance. Add racklines for more storage. Whether it’s medicine, shirts, perfume, eggs, drive shafts, bulk material or even teddy bears – you can store whatever you want, however you want. The OSR Shuttle™ Evo provides space for a wide range of articles and offers diverse storage possibilities. The OSR Shuttle™ Evo provides space for a wide range of articles and offers diverse storage possibilities. The distinctive system design of the OSR Shuttle™ Evo offers the possibility of decoupling performance and storage capacity from one another. The shuttles can change rack line system if necessary, allowing them to access all the articles on a single level. The distinctive system design of the OSR Shuttle™ Evo offers the possibility of decoupling performance and storage capacity from one another. The shuttles can change rack line system if necessary, allowing them to access all the articles on a single level. If higher performance is needed, several shuttles can also be used per level to boost efficiency. 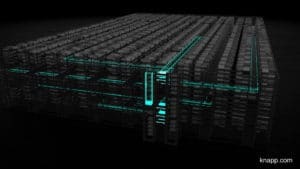 If greater storage capacity is required, the additional rack line systems can be added to the rack block without having to use extra shuttles. 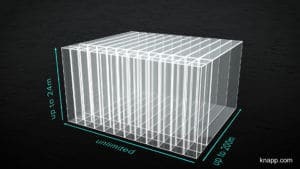 As a result, the storage system can be scaled to current and future demand. This means that the most economic and efficient version of the system is available during each step of the expansion. What’s more, stock and overstock can both be stored in the OSR Shuttle™ Evo in a way that saves on both cost and space. Where necessary, shuttles can change between rack line systems and retrieve goods from the overstock area. Its unique design enables it to put goods into precise sequences as they leave the rack. The OSR Shuttle™ Evo supplies work stations and dispatch areas with goods just in time. This boosts efficiency while simultaneously reducing work. Thanks to the scalable system design and its complete integration in the KNAPP software, the OSR Shuttle™ Evo can be tailored even more precisely to both current and future demands. The system approach of the OSR Shuttle™ Evo can integrate both planned and unplanned developments in your business with unprecedented ease. As a result, the OSR Shuttle™ Evo opens up new dimensions in profitability and investment security. Furthermore, the OSR Shuttle™ Evo boasts an innovative design that won’t fail to impress. The sleek design optimizes the weight of the shuttles. Individually adaptable LED strips with over 16 million different colours give the shuttles a futuristic feel while also serving as a status indicator. The OSR Shuttle™ Evo is designed for durability and low maintenance, which can be seen in the top-quality and robust components of the shuttles. How does the new shuttle combine both design and functionality? And where did the idea come from for the LED strip, which gives the shuttle its special look? Our Development Design Engineer Marc Pendl explains all in the section Evo – behind the scenes. The OSR Shuttle™ Evo is only as good as its integration in the overall solution. It can only achieve its optimal performance level and unfold its economic added value if the system works in complete harmony with the overall logistical solution. Below we will show you some of the perfect matches for the OSR Shuttle™ Evo from the KNAPP system world. The OSR Shuttle™ Evo combined with the autonomous mobile robots (AMR), the Open Shuttles, forms the intelligent and flexible system solution, the OSR Shuttle™ Evo+. The solution brings together the advantages of a high-performance shuttle system and the agility of an autonomous transport system. Goods, raw materials, overstock, buffered orders – everything is stored centrally in the OSR Shuttle™ Evo. The Open Shuttles supply different work stations in diverse warehouse areas directly from the OSR Shuttle™ Evo – just-in-time. 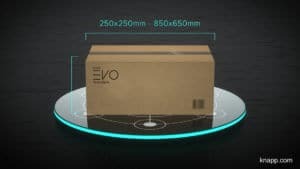 The solution OSR Shuttle™ Evo+ connects every location in the warehouse to the central warehouse system, and can be used for various processes depending on the demands of the individual sector. As a result, the system approach of the OSR Shuttle™ Evo+ allows systems and processes to be interconnected like never before and frees up new ways to organize transport routes. Watch this video to see how the OSR Shuttle™ Evo+ can forge new paths to your success. Our answer is Pick-it-Easy – the multifunctional goods-to-person work station series. The goods-to-person work stations from the Pick-it-Easy series and the OSR Shuttle™ Evo fit together seamlessly. 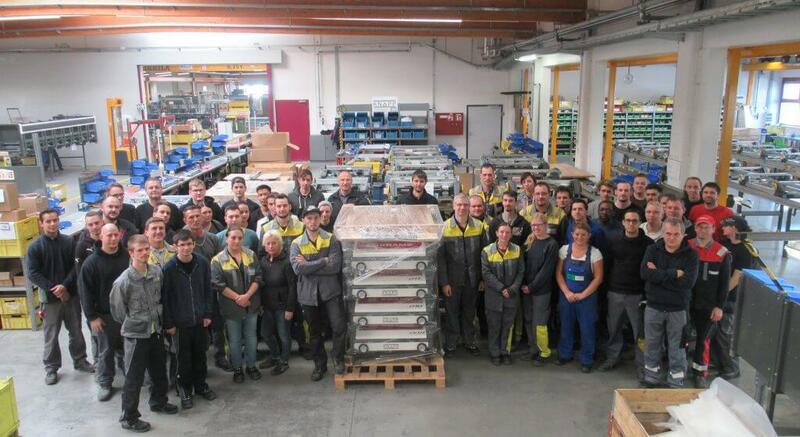 Today, more than 1,000 Pick-it-Easy work stations are in operation around the world. Want to learn more about the goods-to-person principle and the various Pick-it-Easy designs? Pick-it-Easy Evo rounds off KNAPP’s work station portfolio. The new work station brings the benefits of the shuttle system to goods-to-person picking. 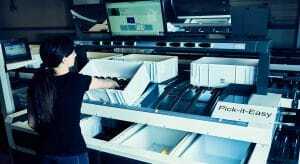 By doing so, the Pick-it-Easy Evo is opening up new possibilities for space-saving design, optimal quality assurance, efficient order processing and for employees, ergonomics and usability. The Pick-it-Easy Evo is an all-in-one work station which together with the KiSoft One software, allows a multitude of functions to be carried out at a single work station. These range from standard functions such as picking, inventory, merging and returns handling, to specific customer requirements. Pick-it-Easy Evo is an all-in-one work station, which is opening up new possibilities for space-saving design, optimal quality assurance, efficient order processing and ergonomics and usability for employees. Ergonomics, efficiency and quality combined in one work station. Pick-it-Easy acts an interface between the employee and the warehouse technology. Just like the rest of the Pick-it-Easy series, the Pick-it-Easy Evo is also characterized by ergonomics and user-friendliness. We made it our goal to re-design both the working environment and the work processes within industry. With Pick-it-Easy Evo, we offer a high-grade industrial work station, which serves as an attractive interface between the employee and the automated warehouse technology. It special design means all tasks can be carried out intuitively with fewer errors. In addition to this, LED displays and touch screens with easyUse user guidance provide support for every work step. The fully-automatic picking solution Pick-it-Easy Robot is an innovative addition to the mix of technologies based around the OSR Shuttle™ Evo. In particular, the picking robot is perfect for applications that demand consistently high performance and quality over a longer period of time. What’s more, the Pick-it-Easy Robot automates monotonous and repetitive tasks such as transferring individual goods to pockets. This reduces the strain on personnel, freeing up resources for other tasks that generate value. Furthermore, the robot solution is also marked by its high degree of customization. There are various grippers, for example, to handle a wide article range. Further developments in image processing also enhanced the robustness of the robot. Moreover, the Pick-it-Easy Robot also makes use of machine learning strategies. For more information on our fully-automatic picking solution Pick-it-Easy Robot. The goods-to-person work station Pick-it-Easy Evo and fully automatic picking with the Pick-it-Easy Robot can both be connected to the central OSR Shuttle™ Evo storage system. This means that a broad article range can be processed. Employees and robots work together in perfect harmony; employees process articles that are unsuitable for robot picking, inspect possible robot errors or carry out value-added services. Humans and robots make a strong team. The robots score points with their consistently high performance over an extended period of time. Humans assume the role of smart workers. They are the creative problem-solvers and help the robots take on new challenges. Read in our blog about the potential of robots within logistics and the future role of employees in the warehouse. Which sectors does the Pick-it-Easy Robot suit and how can the robot be adapted to individual requirements? What role does machine learning play at KNAPP and how do robots learn? 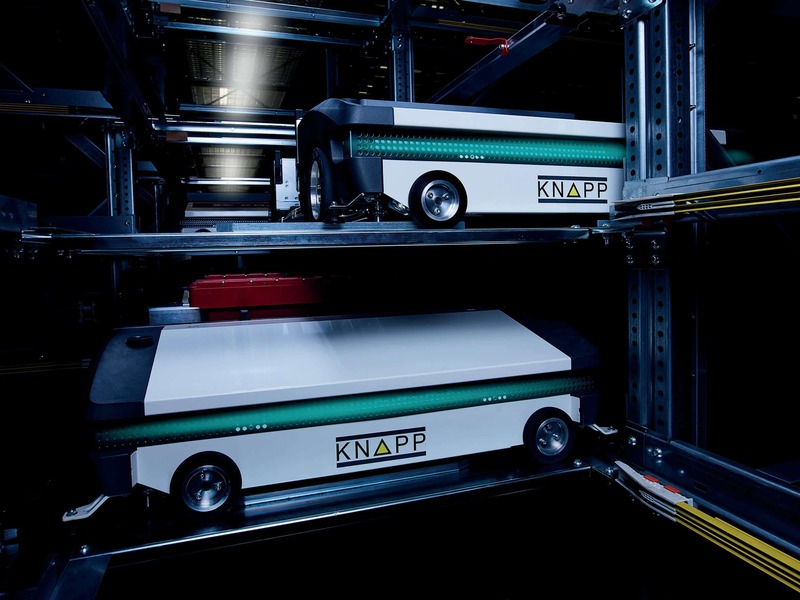 The OSR Shuttle™ Evo is fully integrated in the KNAPP software world and unfolds its full potential in interaction with KiSoft or SAP® EWM by KNAPP. KiSoft SCADA provides a full visualization of the system as well as an overview of the status of all components within the system. 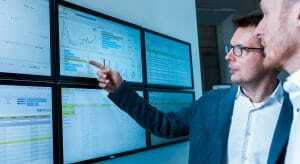 KiSoft SCADA also facilitates optimized, preventive maintenance and swift incident rectification. Depending on the individual requirements, a solution can be monitored with KiSoft or an SAP strategy with SAP® EWM by KNAPP. Data mean success. Our software provides the important information on warehouse stock and KPIs, which serve as the basis for decisions. What’s important when it comes to designing a software solution? What role does software play in a warehouse? What is the 90/10 rule? Mario Rauch, Head of Software Consulting at KNAPP gives us some exciting insights on software. We are pioneers in shuttle technology and have put more than 250 shuttle systems into operation around the globe over the last 15 years. Nonetheless, it’s still exciting to launch a new technology like the OSR Shuttle™ Evo into live operation. Here are some of the companies who already rely on our new shuttle technology. Our customers tell us about their requirements, experience and what made them choose the OSR Shuttle™ Evo. The international Kramp Groep corporation with headquarters in Varsseveld, the Netherlands, was founded in 1951 as a one-man operation. Today, Kramp is Europe’s largest specialist in spare parts and accessories for the agricultural industry and delivers to 26 countries. The company continues to be on a strong course for growth. In keeping with their slogan “It’s that easy”, smooth logistics and great customer service are the cornerstones of the success of Kramp. 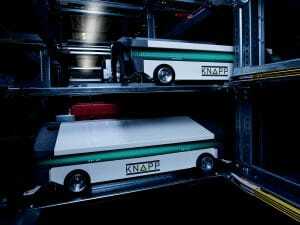 For several years, Kramp has been relying on the intelligent automation solutions by KNAPP for its logistics in Denmark. 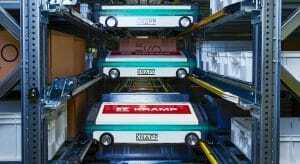 In order to support further growth and to further optimize the service for its customers, Kramp selected a new automation solution that utilizes the brand-new OSR Shuttle™ Evo for the distribution centre at the company headquarters in Varsseveld. Mission: It’s that easy. Make is easy for our customers to run their business. Solution: OSR Shuttle™ Evo for fast, medium and slow moving articles as well as overstock. One-touch picking using the goods-to-person principle at 8 Pick-it-Easy work stations. KiSoft software solution. Step-by-step expansion – 9,600 order lines per hour by project completion. Storage capacity and increasing orders with very short delivery time are among the challenges that Kramp is facing currently. 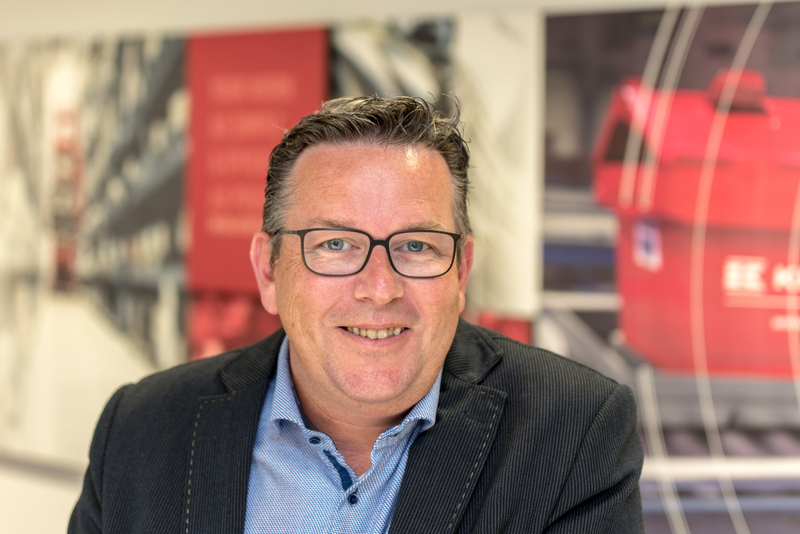 Jan Frans Berends, Logistics Director at Kramp Netherlands explains why Kramp decided on the OSR Shuttle™ Evo and what advantages he expects from the new solution. The German electronics specialist Schukat electronic relies on our new shuttle technology in their new logistics centre in Monheim am Rhein. Schukat electronic’s business comprises low-volume daily business involving articles that need to be shipped as quickly as possible, as well as large-volume forward transactions that have to be delivered to customers on a specific date. The aim of the new logistics centre was to offer the customer even more and more customized services. In doing so, sufficient capacity was needed for the growing article range and for future business growth. It was the first automation project for Schukat electronic. Managing Director Georg Schukat and Thomas Reichmann, aide to the Managing Director tell us why the company decided to automate and how important an equal partnership is to the success of a project. Why did you choose automation with the OSR Shuttle™ Evo? Mr. Reichmann: During the first planning phase, it was not yet clear whether automation in general was the right approach. This wish only arose from the project and from other issues related to it. There were also economic concerns: will this solution be profitable by 2030? We wanted a solution that offered us the flexibility we needed to expand. When we decided to automate, the question was – stacker crane or shuttle? At first, we thought the shuttle system would be too expensive, but then during discussions, we realized how to evaluate the economic end of things. Performance was another criterion in the decision. The OSR Shuttle™ Evo offers us the ability to scale up for when we need the performance. Mr. Schukat: It’s quite a challenge for us at Schukat to plan for the next 15 years in advance. We simply just don’t know what the business will look like in 15 years’ time. 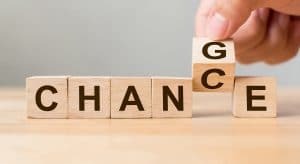 This is why it was necessary to have a flexible overall solution, regardless of the system, which would enable us to continue our business in 15 years, whatever it looks like. This call for flexibility is what led us to choose the OSR Shuttle™ Evo. At KNAPP, “innovation is our tradition”. To what extent are the values innovation and tradition reflected in your company philosophy? Mr. Schukat: Independence is especially important to me. We gladly work with external partners as equals, whether they are customers, suppliers or institutions. Traditions can only be maintained if a company has a certain level of financial or structural independence. For this reason, we cultivate long-standing relationships with our customers and suppliers and utilize products as sustainably as possible. In all of this, we want to be innovative, to dare to attempt things and to tread on new paths. This does not mean, however, that we blindly follow every trend. This is not innovation and contradicts tradition. We want to be a partner for our customers, employees and suppliers, where innovation makes working together easier and better. Long-term success will only be achieved if things are improved within a partnership over the long run. Which advantages do you expect from the new system? Statistics have shown that our pickers walk an average of 8–10 kilometres per shift. For us to develop further without automation, we would have to ask our employees to walk 15–20 kilometres, which is simply impossible. We also need more capacity and are aiming to triple it. For this we need to create more space. The OSR Shuttle™ Evo must be flexible enough to continually adapt to changing demands. Read the whole interview in the 3/2017 issue of our World of Solutions magazine. The level of service is increased by using the OSR Shuttle™ Evo: We can expand our article range and also increase the availability, because we can always draw on the bulk in the system. The system is also very fast, so we can extend the period in which our customers can make orders. I’m proud that I still enjoy striking out in new directions. Working with KNAPP is particularly interesting because there are so many possibilities. They also recognize that their customers have ideas and needs too, and that we can build upon these to move head into the future. Our innovations are the brainchildren of many different people and it was no different with our new shuttle system, the OSR Shuttle™ Evo. Here you get the chance to hear from some of our colleagues from diverse divisions. They tell us about the challenges they face and their personal highlights from the OSR Shuttle™ Evo project. One of the exiting challenges in developing a new product is to allow function and design to flow harmoniously into one another. Marc Pendl is one of our design engineers and was involved in the mechanical development of our OSR Shuttle™ Evo starting with the first idea and continuing through to prototype construction and production. The development took about two years. Marc gives us an exclusive view backstage with our design team. What were the challenges in the design of the new OSR Shuttle™ Evo? Our goal was to get our corporate design to come alive in the product. The challenge was bringing together both construction and design. As a design engineer, you want as much space as possible for the installation of the components. This looks rather boxy or chunky in design. Form generally follows function but our designer was unsatisfied with this shape. The challenge became finding a way to get as much volume as possible into an appealing shape. How did function and design come together in the new shuttle? Function and design can be found, for example, in the shuttle’s 4 plastic corner elements. These assume various mechanical tasks such as bearing the wheels. With this corner element, the installation is easier and faster, and the shuttles can also be space-effectively and stably stacked for shipping. It is always important that design elements do not limit the flexibility of the product. 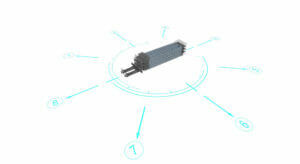 For the OSR Shuttle™ Evo, this affects the middle section of the shuttle grill. The shuttle can be adapted in width for the requirements of the customer. (laughs) We get that a lot. It’s a funny coincidence that people make this association. Even so, our clear design goal was to create an optically pleasing shuttle and to make a mark on the shuttle market, we were really not thinking about cars. The illuminated bar that gives our shuttle a special look came about because it was functional – we wanted to integrate the status indicators harmoniously with the design. Design meets functionality;: The illuminated bar that gives our shuttle a special look and serves as a status indicator. On June 4, 2018, the day had arrived. The first OSR Shuttle™ Evo in the world went into operation at agricultural technology expert Kramp, in Varsseveld, the Netherlands. Joy Naumann was on site as a startup engineer and was responsible for establishing the shuttle configuration, startup and testing on site. Here, he shares with us his take on the first ever startup of the OSR Shuttle™ Evo. What is the challenge when starting operation with a new technology for the first time? It’s really just that, that fact that it’s a new technology. You do pioneering work and don’t know exactly what’s coming your way for the startup. Working on the construction site in close cooperation with our development department and creating the test scenarios for the shuttles was particularly exciting. But I have to say, it’s just this type of challenge that really motivates me. I always loved to tinker, and it’s easy for me to get motivated about finding solutions and having everything function as expected. Is there something in particular that you personally got out of the project? Of course! I really got the chance to develop personally with this project. I used to always try to solve all the problems by myself. In this case, it wasn’t possible, because we were starting up a completely new system. I had to constantly consult with various people in the company to get the information that I needed. What this taught me was that working as a team accomplishes more than working alone. I have really become more open and have gotten to know many colleagues that I didn’t know before. What was your most memorable moment on the construction site? There were really a lot of great moments. Just seeing the shuttle live for the first time was absolutely fantastic. There were also moments to remember with the customer. When the customer saw his shuttles up and running for the first time, he was just beaming. This makes me feel proud and is also a highlight because I know – I did that. Are you ready to change the world of logistics together with us? Are you interested in a new challenge in our installation and start-up team? Check out our vacancies worldwide.